It was Edwin Land’s birthday on Monday May 7th, he would have been 105 yrs old. Polaroid film has played a creative part in my life as a photographer. 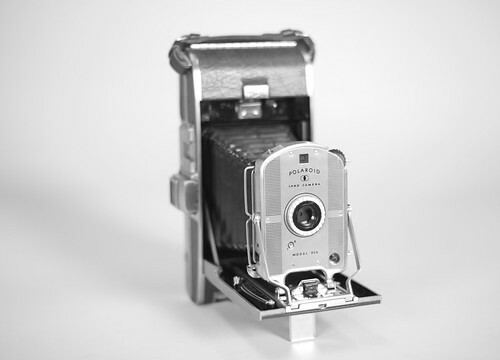 Back at the beginning, Polaroids (typically Polaroid Type 64 4×5) were used as test shots in the studio instead of shooting & processing 4×5 slide film. We would test our shots for lighting and positioning … it was cheap. I would always say that Polaroid was like water. NOT TODAY! Gene Rogier was a boss of mine at Image Source & I remember him creating a Polaroid transfer for the first time in around 1989 and I was hooked! I’ve been shooting and creating Polaroid transfers & emulsion lifts ever since. I’ve had the opportunity to give workshops and teach an Independent Study on Polaroid transfers & emulsion lifts. I’m sad that Polaroid film has gone away, it is nearly impossible to get anymore at a reasonable price. I’m sad to see Fuji FP3000bw being discontinued. Over the last few years I’ve used Impossible Film since Polaroid has gone away. It’s a great 600 & Spectra camera film and I look forward to it getting bigger & better in the future. I super excited to see what is in store for New55 and I can not wait until it is finally available the public. Time will tell. ~ Below is a very small collection of my Polaroid transfers & emulsion lifts, Polaroid Type 664, and Polaroid Type 65 P/N 4×5 images. Berkley – One of my first 4×5 Polaroid Transfers (1990). Shot in our apartment in Evansville, IN. Roxy sleeping – An early Polaroid transfer on Type 59 4×5, taken 1990. Debrecen Hungary – 35mm slide, Polaroid transfer from a DayLab, Polaroid Type 669. Bunch of tulips – An original Polaroid emulsion lift. Magnolia closeup – Polaroid Type 64 print. White Magnolia – A 4×5 negative direct print from Polaroid Type 55 P/N. Abby dressup – 4×5 Polaroid transfer – Daylab. Dayton Cemetery – 35mm slide – Daylab Polaroid transfer on Type 669. Steer NM. – Polaroid emulsion lift from 35mm slide on a DayLab. Pencils gathered – Polaroid Type 59 4×5 print from a DayLab. 35mm slide – Daylab Polaroid emulsion lift Type 669. Marblehead – Polaroid Type 59 – Polaroid Transfer from 35mm slide on 4×5 DayLab. Barista – Expired Polaroid Spectra film. White barn – Expired Polaroid Silk 664. At the Prater – Polaroid Type 669 collage shot from a 35mm slide on a Daylab. Cedar Falls – Polaroid Type 664 shot on a Polaroid 420 Land Camera. Ash Cave – Polaroid Type 664 shot on a Polaroid 420 Land Camera. Open Thrift – Expired Polaroid Type 55 – positive image. Mammoth – Anza-Borrego Desert / Expired Polaroid Silk 664. Lizard Tavern – Polaroid Type 600 Expired film. Anniversary Tulips – Expired Polaroid Type 669 Polaroid transfer. The first image (Project) is one of my first Polaroid images shot, and the last image (Anniversary Tulips) is to date my last Polaroid transfer created on April 17th, 2014. As summer begins, I thought I’d come up with something fun to do around photography, like a challenge or topic or theme. I have a decent collection of cameras but they are rarely used, they are sitting on several shelves in the studio … that got me thinking! Each week I will shoot with a different camera and I will blog about the shooting with the camera. I will document each week giving my thoughts about the camera & the pros and cons of it. This is not my entire camera collection but it is a good selection. Let me know if there is a specific camera you would like me to shot with. Follow me on Instagram & twitter (@scotthuckphoto) to stay up on the latest of my summer project. In the meantime, I need to come up with a theme name. Remember, film is not dead! Believe in film! !